This East Peoria native and Spalding ('82) graduate took the Irish to the 1982 state finals before obtaining an industrial engineering degree from Northwestern where he was an All-Big Ten catcher in 1985 and 1986. Drafted in the 5th round MLB draft by the Chicago Cubs, Joe turned a successful major league playing career into a managerial career, first as bench coach of the New York Yankees, and recently as manager of the Florida MarIin. 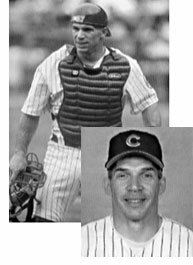 Joe's playing career spanned 15 seasons with the Cubs, Rockies, Yankees and Cards, winning World Series rings in '96, '98 and '99. He was selected to the N.L. All-Star team in 2000. He caught Dave Cone's "perfect game" in '99 and Dwight Gooden's nohitter in '96. His career stats include a .267 batting average, 186 doubles, 26 triples, 36 homers, 454 runs scored and 422 RB's. He played in 1277 games, collecting 1100 hits. A superb handler of pitchers, his career fielding average was .991 bettered by only two major league catchers with 15 year careers in MLB history. Front Row: (from left) Eric Young, Bill Piskorski, Dan Young, Doug Neal, Jerry Metz Rob Strand, Bryan Harvey, Bob Hoftiezer, Bill Elkins, Tom Thornburg, George Brent, Bob Hunt. Second Row: (from left) Coach Tom Peeler, Assistant coach Bob Rogers, John Wand, Tom Peeler, Ward Eastman, Doug Englebrecht, Doug Birdsall, Steve Krisman, Rick White, Mick Baietto, Todd Huson, manager Roland Cobb. Third Row: (from left) Assistant coach Charles Siebel, Assistant coach Don Wyss, Chris Trimble, Joe Muir, Ken Kirkpatrick, Rob Rummel, Mark Ruff, Jeff Simons, D.R. Phillips, Mark Spink, Rick Bengston, manager Randy Warner, manager Scott Carlisle. Fourth Row: (from left) Tom LaBarr, Tom Klahm, Steve Anderson, Ray Bach, Jim Feucter, Doug Rittler, Ron Albert, Gus Myers, Tom Baum, Bob Moseman, Bill Babcock, manager Greg Fall. THE 1969 RICHWOODS HIGH SCHOOL FOOTBALL TEAM, coached by Tom Peeler, produced the first unbeaten team in the history of the school when it raced through a 10-game schedule unscathed. The team was ranked No. 1 in the state and won the Mid-State Nine Conference title. The Knights boasted a torrid offense that averaged almost 40 points a game plus a tight defense that produced five shutouts and allowed just six touchdowns all season. Only Peoria Central was able to score twice on Richwoods in a 20-13 game. Fullback Bob Hoftiezer, an 185-pound senior fullback, won all-state honors and led a large contingent of Knights on the Mid-State 9 All-conference team. Others to be honored were quarterback D.R. Phillips, halfback Dan Young, guards Tom Thornburg and Tom Peeler, tackles Eric Young and Bill Elkins and end Ward Eastman. Special mention went to center Tom LaBarr and end Bob Moseman while halfback Bill Piskorski received honorable mention.